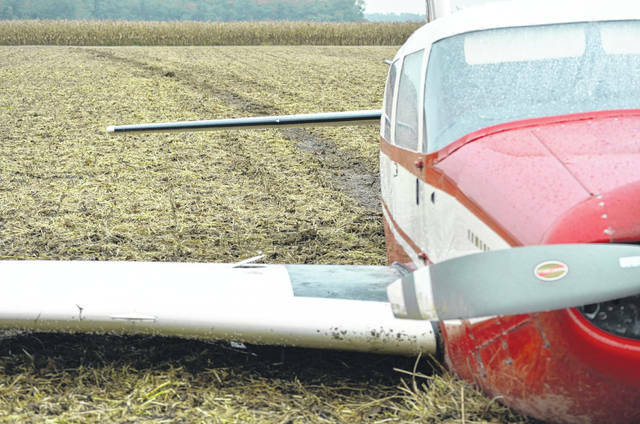 A Michigan man was forced to make an emergency landing in a Putnam County cornfield Friday. No one was hurt. Troopers with the Ohio State Highway Patrol investigate the scene of a Friday plane crash near the intersection of Road 5 and Road 5F in Putnam County. A family flying from Michigan to Kentucky survived a crash landing in a Putnam County cornfield Friday after experiencing engine failure at around 8,000 feet. The pilot, Daniel Paternoster, performed an emergency landing but the landing gear popped back into the plane after impacting the ground. 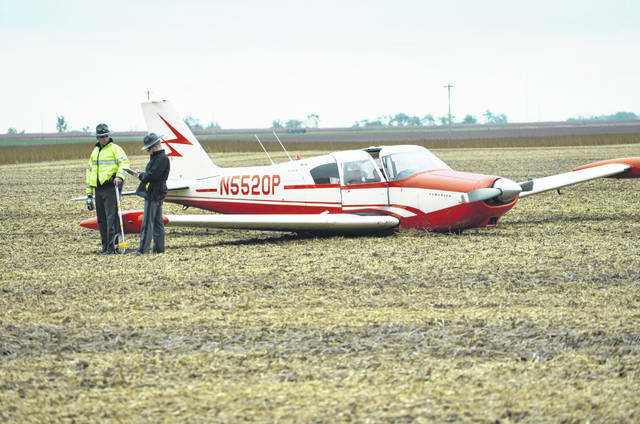 LEIPSIC — A Michigan man piloting a small-propeller plane performed an emergency landing in a Putnam County cornfield at about 11 a.m. Friday after experiencing engine trouble at about 8,000 feet. Daniel Paternoster, of Fowlerville, Michigan, his wife, Nancy Paternoster, and daughter, Rachel Dudley, were not injured when they were forced to land while traveling from Michigan to Kentucky, said Sgt. Nicholas Boes, of the Ohio State Highway Patrol. Paternoster attempted to land in a field near the intersection of Road 5F and Road 5. 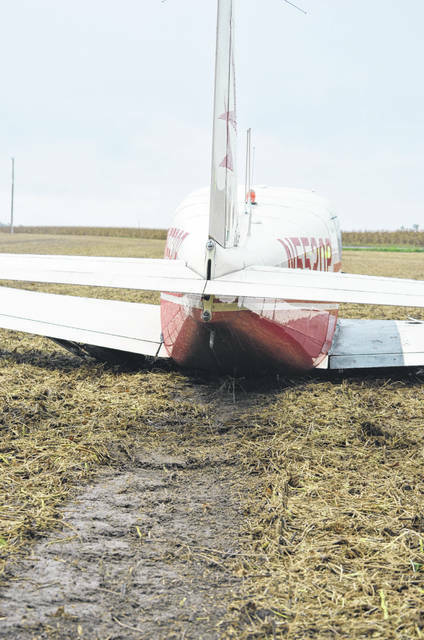 The impact of the plane landing pushed the landing gear back up into the plane and led the craft to slide through a harvested cornfield. It slid through the rain-drenched field for 328 feet, leaving a trail curving slightly to the right, before coming to rest. The crash left the propellers bent and the plane itself damaged. According to the faa.gov/airmeninquiry website, Paternoster was issued a commercial pilot license in December 2008 and is rated for single-engine planes. The plane he was flying was a Piper, PA-24-180 fixed wing, single-engine plane manufactured in 1958, according to the faa.gov/aircraftinquiry website. Boes said an investigator with the Federal Aviation Administration was on the way Friday to determine if the engine failure was a mechanical problem or operator error.